What to do with leftover risotto? Quite simply, risotto when left overnight will solidify enough to for you to form a ball if you wet your hands enough. This is thanks to the starch that the rice imparts along with some dehydration. And the rest is quite simply rolling the individual balls on some breadcrumbs – do use Panko because they are crispier than traditional breadcrumbs – a bit of salt and pepper. Since your risotto is tasty to begin with, you don’t really need much seasoning to make risotto balls. 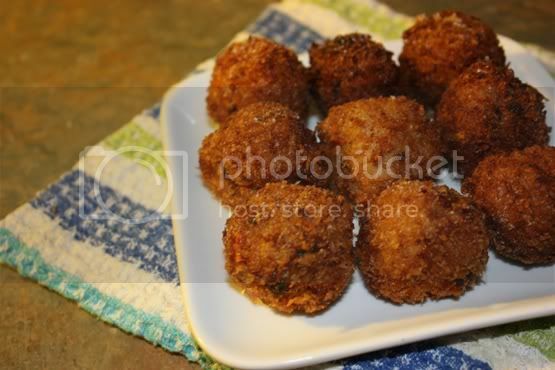 Deep fry the breadcrumb dredged risotto balls until golden brown and use marinara sauce as dip. Simple, delicious and quite hedonistic. A cup of left over risotto will make about 6-8 risotto balls depending on how big you make them to be. 1. Mix the panko breadcrumbs with a pinch of salt and some cracked pepper. 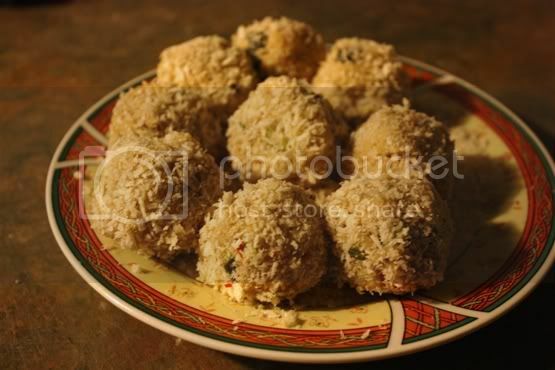 Roll the risotto balls into the breadcrumbs to dredge. You don’t need eggwash for this because the breadcrumbs will stick very well to the balls, thanks to the starch. 2. 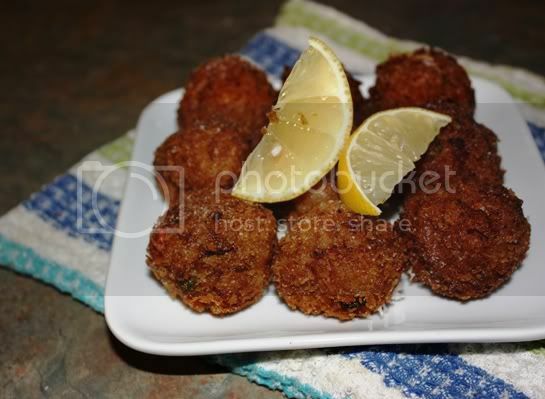 Deep fry the risotto balls until they are a crispy golden brown. Transfer them to rest on paper towels to and season with some salt over risotto balls. 3. Serve with marinara sauce as a dip or over a bed of greens as a salad. Lemon wedges would go very well to squeeze over the top before serving. For recipes on risotto, check out my Roasted Cauliflower Risotto and Peas and Broccoli Rabe risotto. Never waste food. A great yummy side dish. I agree. Great leftover idea. great yummy recipes nice page look keep up the good work. I just had these at a friend's house last night. She added Mozarella cheese and Prosciutto to them. She baked them, which I may try to do. I am frying challenged. They turned out just great and everyone loved them. I was thinking of them for my Christmas party (always looking for something to soak up alcohol). You pics look great!! Hey this is like that Arancini thing I had at Table Seven. Yea it is arancini, except at the time when this was posted, I didn't know it's Italian name and Jamie Oliver only called it risotto balls.